From its rough, rugged Connecticut Broadleaf maduro wrapper to the intense finish, The Rake would be right at home at the poker table in the Long Branch Saloon. 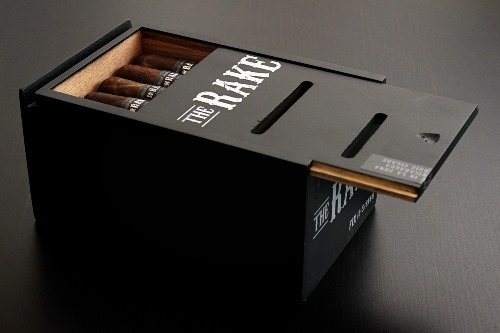 The Rake is the second regular production line from MoyaRuiz, a small firm that has already made an impression in the cigar world with a couple of offbeat limited editions and its initial La Jugada line. The Fix starts with spice and pepper and a bit of a back-of-the-throat scratch. For the first third, in fact, it seemed that might be its single distinguishing characteristic. Fortunately, though, that began to lessen as the second third began, opening up to some dark flavors like burned coffee, roasted nuts, and charred wood. As I progressed down the box-pressed frame (5.6 x 46), there was lots of smoke, a slightly loose draw, and a not-so-great burn. The thick wrapper, at times, seemed almost fireproof. The cigars are rolled at Erik Espinosa’s La Zona factory in Estelí, Nicaragua. The Rake comes in boxes of 20, with three sizes in addition to the Fix: Cut (5 x 52), Take (6 x 52), and Vig (6 x 60). The boxes and bands, like the names themselves, all reflect a connection to poker. I bought a five-pack ($47.50) back in the summer and smoked a couple then and a couple recently. Six months or so in the humidor seems to have made a little difference, especially in reducing sharpness. With such a distinctive profile, I wouldn’t regularly smoke The Rake. But I would definitely pick one up on occasion for something different. I recommend it, especially in this size, and give it four stogies out of five.